It seems like we have been hearing about the ASUS Padfone for years now, and it still isn’t out. If you have been waiting for a phone that comes with a stylus that docks into a tablet that turns into a laptop, this video should whet your appetite a bit. The good people over at NetbookNews got their hands on the crazy device and unboxed all of the boxes for you, showing off everything that ASUS has up their sleeve. If Ice Cream Sandwich wasn’t enough on one device, how about all three? The phone, tablet and resulting laptop all run Android 4.0, and pretty smoothly from what the video shows. 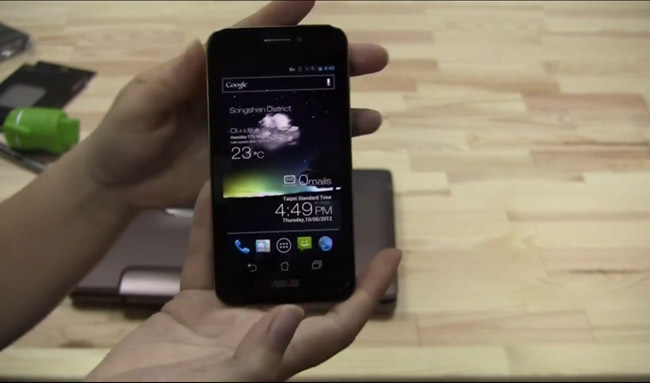 Remember it does have a Snapdragon S4 dual-core processor in it, clocked at 1.5GHz. The phone’s screen is a 4.3″ Super AMOLED display and the phone has an 8MP camera on the rear that also is the camera the tablet uses. You have to watch the video to really understand how it all, literally, fits together. It’s an interesting device andASUS may have an audience here, the device(s) are certainly something to talk about if nothing less. Any readers planning on picking this up when it finally hits stores?